FHA/VA APPROVED CONDOMINIUM! ONLY CHESAPEAKE LAKE VIEW AVAILABLE. Unparalleled long lake views with a spectacular sunset exposure and wonderful natural light. This home is move in ready, freshly painted, clean and vacant. Where can you buy 2, 300sqft. under $400, 000? The appointments include solid wood cabinetry thru­-out, granite counter tops, tile flooring on the diagonal, tray ceilings and more. This is a great room plan with a spacious kitchen and breakfast nook, a Butler's pantry through to formal dining or loft/den area. The master bedroom is roomy with a large master bath. 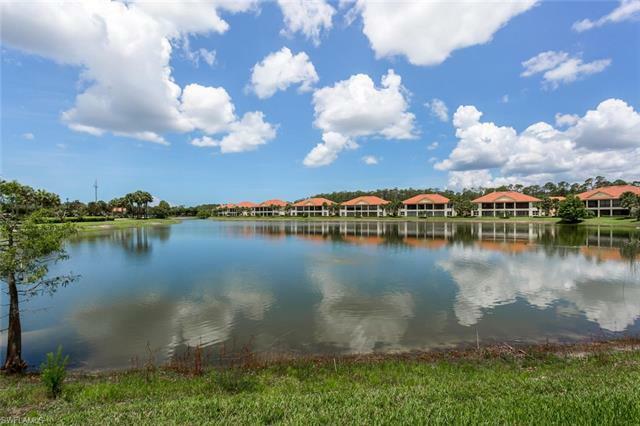 The community is gated with 24 hour security and amenities which include two pools, two spas, two tennis courts, two fitness centers, and two clubhouses. Enjoy walking, biking and running through the lake filled community. The community is social with monthly social events, card groups, men and women luncheons, community outings, book clubs, game nights and more. Hawthorne is conveniently located to fine grocery shopping, restaurants, Coconut Point Mall, Miromar Outlet Mall, RSW Airport, Naples, Fort Myers and our beautiful beaches.